The Sierra Nevadas is a formidable mountain range running north - south for over 400 miles (primarily) through the state of California. It’s natural beauty and rugged terrain has drawn visitors - both by land and air for decades. It is home to three national parks (including Yosemite), Mount Whitney (tallest peak in the lower 48), and Lake Tahoe (largest alpine lake in North America). It is also a veritable graveyard for airplanes. Due to its proximity to major urban centres, the Pacific Ocean, and it’s scenery, both civilian and military pilots have been drawn to this area. The high Sierras are no place for inexperienced pilots though, as bad weather, and the infamous “mountain wave” have led to this region earning the nickname of the “airplane graveyard”, with hundreds of wrecks littering the peaks and valleys. When famed aviator Steve Fossett disappeared while on a routine pleasure flight in Sept. 2007, it set off the largest public-private search effort in US history. During the search, Civil Air Patrol and private searchers spotted dozens of wrecks from the air. Most were verified as known crashes by cross-referencing crash records kept by the National Transportation Safety Board, or the US Air Force. Several of the crash sites, however, were never ground truthed to positively identify the wreckage. This July, a team of experienced Adventure Science mountain athletes will return to the Sierra Nevadas to find, and identify several of these wrecks - hopefully providing closure for the families of missing, but not forgotten pilots such as San Francisco businessman Charles Ogle, missing since 1964. In order to reach these wrecks though, the Adventure Science team will have to deal with high altitude (these are all located above 9000 feet), vertical terrain, and arduous off-trail hikes. The team will focus on three primary targets - a blue and white wreck spotted in rugged alpine terrain near Lake Tahoe, a white airplane wrecked high above treeline, and a metallic object with glass wedged high in a cliff above a canyon in Yosemite National Park. These objects have remained a mystery due to their inaccessibility. Over the course of one week, the athletes will use their mountaineering skills, and ropes when necessary, to locate these wrecks. 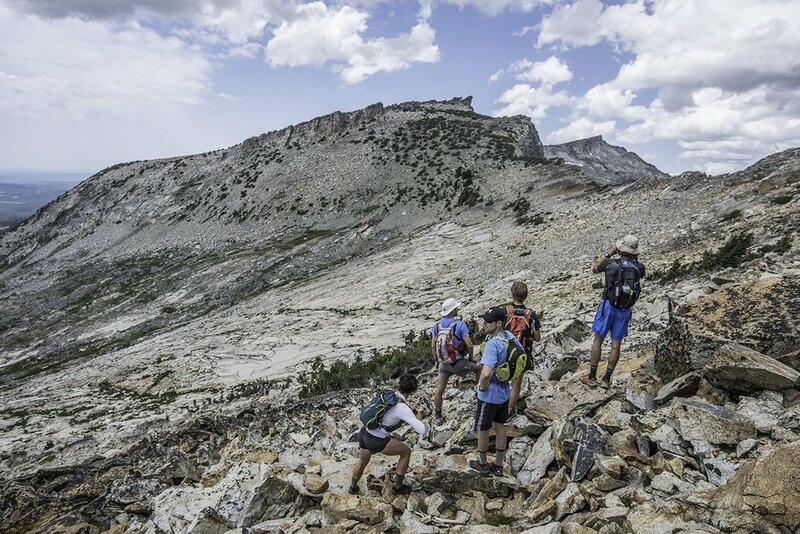 From July 18th to the 26th, the Adventure Science team hiked and ran well over 50 miles through the Sierra Nevada mountains in search of unknown airplane wrecks. Working off of a list of sites spotted from the air during the 2007 Search for Steve Fossett, the team had little to go on but UTM coordinates that in some cases, were known to be nearly 1 mile off target. Day 1: Heading to Mt. Price in the Desolation Wilderness in search of their first target (south of Lake Tahoe), the team spent a long and gruelling day hiking and scrambling through the alpine terrain. Ultimately, the coordinates from whatever was seen, and recorded from the air did not prove to be airplane wreckage. The team spent several hours searching the surrounding peaks and valleys for additional clues, as well as racing thunder clouds. The search day finished without finding airplane wreckage, but knowing that the CAP coordinates do not yield a wreck site near Mt. Price. A call to the National Forest Service was met with assurance that no wreck has been removed. Two employees recounted that they heard rumours of a wreck in the region, but knew of nobody who had visited it. Day 2: With renewed hope and enthusiasm, the team got on early start from their base in South Lake Tahoe in order to search for a wreck described as a white metal airplane, located on the flanks of Mt. Raymond in the Eldorado National Forest. As part of the pre-search research, satellite images were reviewed and wreckage was identified approximately 1/2 km east of the listed coordinates. Once on site, the team trekked uphill directly towards the coordinates of the wreckage seen in Google earth, and was rewarded with the debris from a 1968 Mooney Ranger, with tail number N6727. Thanks to a legible tail number, the team has been able to determine that this was indeed a known wreck, and gather information on the details surrounding the crash itself. Day 3: To give the body and mind a breather, the team went for a shake out hike on the north side of Lake Tahoe - enjoying the well groomed Tahoe Rim Trail and some incredible views from Mt. Baldy and Rose Knob. Day 4/5: Riding the success of day 2, the team was ready to tackle what they knew would be their most difficult search on this trip. Deep inside of the “Grand Canyon” of Yosemite Park, the team followed the Tuolumne River to coordinates where a supposed wreck, described as “black object and glass wedged high into a cliff” was located. The team enjoyed a well groomed (and well travelled trail), incredible scenery, and some beautiful trekking. With the steep/vertical sided canyon walls highly visible from numerous vantage points, the team thoroughly scanned location of the coordinates, as well as the surrounding area (up and down canyon). What became quickly evident, was that natural water seeps, which sprang from the cliff face itself did two things to the granite walls - 1) made them have a mirror like reflectivity when illuminated by the sun at the right angle, and 2) stained the surrounding rock black due to mineralization and biologic activity. This is what the team attributed the spotting of “glass” and a “black object” to. After thoroughly searching area, the team hiked back out, ending the 2-day search. Day 6: Day 6 saw the team well ahead of schedule in their search, opt to search for two wreck sites spotted in the Bodie Hills area. 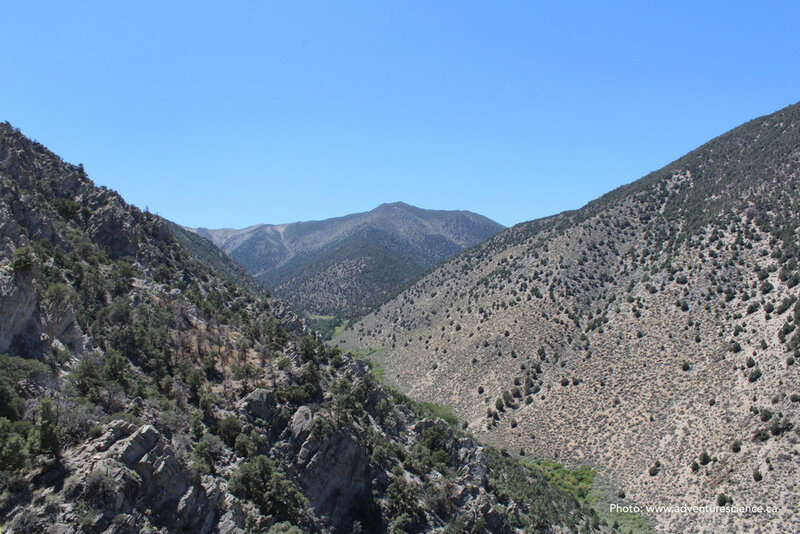 The first search of the scrub and juniper covered hills in the Mt. Beideman area did not yield any results aside from the discovery of several interesting historical artifacts. The second search that day, deep in the Bodie Hills resulted in the corroboration of a wreck site (most of the debris has been removed) with CAP coordinates. The accident occurred in December 2006, killing the pilot and destroying his Piper “Cherokee” N8001H. Day 7: Tired, and full of burrs and blisters, the team woke early for a quick detour to view the beautiful Twin Lakes. Here, Adventure Science saw it’s first love connection take the next step as Dr. Tim Puetz surprised everyone present with his marriage proposal to Ms. Helene Dumais. She said yes, high fives and hugs were shared, and the on Helene’s urging, the team piled back into the trucks and headed into Nevada to check one last site, en route to their departure airport in Reno. The wreckage as seen and geo-referenced by CAP was described as an “orange wing”, located on the flank of a steep canyon. The team entered a narrow canyon and traveled rapidly to the CAP coordinates before spreading out and exploring the area in great detail. While no airplane was discovered, the team did flush out several deer, and a female black bear with two small cubs. The forest in lower portion of the canyon was burned, which provided excellent visibility for the teams. As the athletes travelled further up canyon, the pine forest became thicker, although visibility was still good throughout. After several hours of extensive searching, the team conceeded that the coordinates were likely incorrect, or that the wreckage had possibly been removed since the CAP sighting. Overall, the project was a success. Several wreckage sites were (re)located, and the coordinates attached to several other supposed sites were proved to be incorrect, indicating that the spotters were mistaken in identifying a wreck, or that the coordinates were incorrectly recorded. The team will continue to research the sites to learn the back story of N6727, as well as to determine whether any of these other sites had seen aircraft wreckage removed since 2007. Adventure Science wishes to thank the athletes who participated, Luis Moreira, Keith Szlater, Chris Killian, Richard Rothaus, Rory Bosio, and Canada Satellite for their involvement and support of this project.